Book Mark Pollock as a keynote speaker with VBQ Speakers. Mark is an explorer and collaboration catalyst who helps people achieve more than they thought possible. Unbroken by blindness in 1998, Mark went on to compete in ultra endurance races across deserts, mountains, and the polar ice caps. 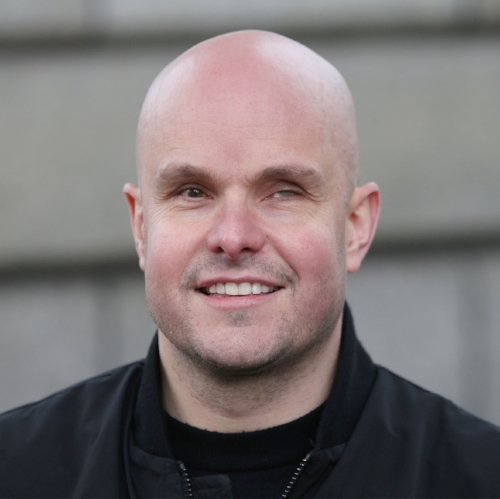 For more information on motivational and technology speaker Mark Pollock, contact VBQ Speakers founding agent Leo von Bülow-Quirk on leo@vbqspeakers.com or 0044 7833 727090. Mark is an explorer and collaboration catalyst who helps people achieve more than they thought possible. Unbroken by blindness in 1998, Mark went on to compete in ultra endurance races across deserts, mountains, and the polar ice caps including being the first blind person to race to the South Pole. He also won silver and bronze medals for rowing at the Commonwealth Games. In 2010 Mark was left paralysed after falling from a second story window. He is now exploring the frontiers of spinal cord injury recovery combining an innovative electrical stimulator over his spinal cord and a drug super-charging his nervous system, whilst walking hundreds of thousands of steps in his Ekso Bionics robotic legs. Through the Mark Pollock Trust he is on a mission to find and connect people around the world to fast-track a cure for paralysis. Selected by the World Economic Forum as a Young Global Leader and appointed to the Global Futures Council on Human Enhancement, Mark is on the Board of the Christopher and Dana Reeve Foundation (USA) and is a Wings for Life Ambassador (UK). He is the subject of the acclaimed documentary called Unbreakable, is a TED Global, Davos, Wired and EG speaker and is co-Founder of the global running series called Run in the Dark. Sometimes we choose challenges, and other times they choose us. Mark reminds us that, even in when fate deals us a difficult hand, we are in control; we decide our place in the future. Mark speaks at Wired about the importance of ambition and having the courage to think differently. "Mark spoke at our sales conference. The impact was instant and the messages continue to affect our people. His delivery was awe-inspiring and truly humbling, which forced us all to take a step back and consider how we face challenges and make decisions. Empowering our teams to take action and avoid excuses is key to our success as a business and Mark's story demonstrates how to do that."